(June 21, 2016) The North Carolina Department of Transportation (NCDOT) has opened a public comment period that runs from June 20 to July 22, 2016 to obtain public input on its preliminary list of projects that are proposed to receive local input points as part of it’s Prioritization 4.0 (P4.0) process. 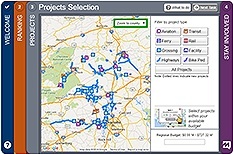 Prioritization is NCDOT’s decision making tool for developing the next State Transportation Improvement Program (STIP), which is a listing of projects to be funded and delivered within an upcoming five-year work period. 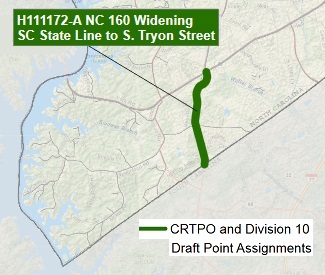 NCDOT Division 10 is proposing to assign local input points to the widening of Highway 160 (Steele Creek Road) from Highway 49 (South Tryon Street) south to the South Carolina state line. The local input points will help ensure that this widening project will receive strong consideration for inclusion on the next State TIP to be approved in fall 2017. 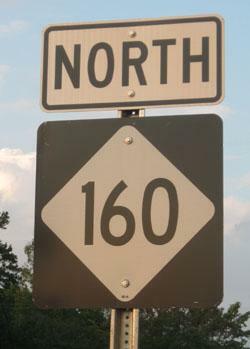 Your comments will encourage NCDOT to continue to maintain the Highway 160 project among the priority projects. For more information on the NCDOT prioritization process, including the development of the 2018-2027 STIP, see 2018-2027 STIP Development or view a video at STI Comment Period 2016. Information on the comment period and meetings is near the bottom of the page. You may also use the "Share Your Thoughts" button to comment on general and specific priorities. NCDOT Division 10 likely will assign local input points to the Highway 160 project regardless of what comments it receives. However, prioritization is a long process, and staff must make many decisions that effect how projects can move up in the priority and eventually get funded. Both NCDOT and CRTPO staff have been influenced by the strong support the community has expressed for Highway 160 projects, both through comment opportunities and at the Steele Creek Residents Association annual meetings. Your continued support of Highway 160 projects will help ensure that staff maintains an awareness of their importance as they evaluate and select projects for inclusion in future construction plans. The N.C. Department of Transportation is asking the public to provide feedback on the quantitative scores and preliminary local input points assignments for the transportation projects for the upcoming State Transportation Improvement Program (STIP). The STIP document is developed under the Strategic Transportation Investments law (STI), which established the Strategic Mobility Formula. In fall 2015, NCDOT and local planning organizations assembled and submitted projects for scoring after collecting public input for the 2018-2027 STIP. NCDOT is hosting 15 information sessions across the state between June 20 and July 14, to receive input on the locally identified priorities and points assignments methodologies that will result in a Draft STIP next year. You can find a short video at STI Comment Period 2016 Video. Feel free to post this link on your websites. Anyone who cannot attend a session in person can easily view all the materials and submit their comments electronically through MetroQuest. MetroQuest is a very engaging and interactive public input tool that will allow you to choose your priorities and express your concerns. All information can be found at http://www.ncdot.gov/sti. We want your feedback. The purpose of this communication is to invite and encourage your participation in the development of North Carolina’s transportation network. The public comment period will run from June 20 – July 22. *Public feedback is very important to us - putting people first is a common sense way to plan and design public infrastructure. Please assist us in maximizing public outreach by forwarding to your constituents, members, and/or staff. Note: NCDOT will provide auxiliary aids and services under the Americans with Disabilities Act for disabled persons who want to participate. Anyone requiring special services can contact Anamika Laad at alaad@ncdot.gov or 919-707-6072 to make arrangements. NCDOT will provide interpretive services upon request for persons who do not speak English, or have a limited ability to read, speak or understand English. Requests can be made to the following number - 1-800-481-6494.